Mums, Dads, Grandparents, listen up! No more lugging a heavy, cumbersome travel cot around – your sweet new cherub can play and nap anywhere with the Fisher-Price On-The-Go Baby Dome. Perfect for indoors and out, the On-The-Go Baby Dome is just the ticket for keeping your little one happy and safe when not being cuddled. Part play pen, part bassinet, the Baby Dome provides a secure environment for a baby to play or catch a quick nap without the risk of over zealous siblings knocking into them. Easy on the eye in grey, the Baby Dome includes two removable toys to dangle overhead and a breathable, UV resistant mesh canopy to provide sun and bug protection – great for picnics, camping and even visits to the beach! 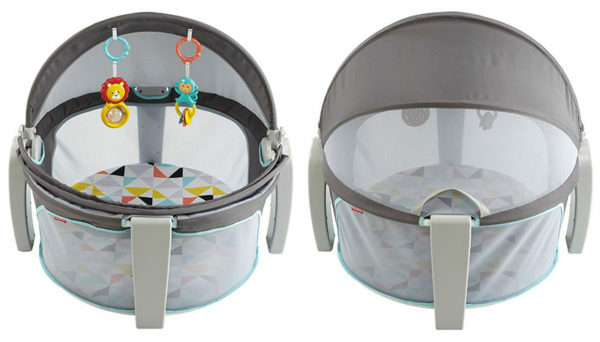 Completely portable, the Baby Dome folds flat for easy travel and storage. The Fisher-Price On-The-Go Baby Dome is available from leading retailers, including Big W, priced $129.